We could debate forever about how to respond to persons with mental illness. Honestly, the excuse that "people fear what they don't understand" is a paper thin excuse. It is no longer valid. Yet, here I am writing about the injustice shown toward those with mental illness...better or more appropriately understood as a brain chemistry illness. Oh how weary it gets...saying the same things over and over, only to be met with the same response or perhaps no response. In a recent facebook post, I stated how grievous this lonely road is. I dared to pour my heart out looking for a kind word and sadly, I was met with less than a thimble full of comments. One person said they were sorry. And a second said "how sad for you...people fear what they don't understand." And I got angry! Yes, I am sick and tired of ignorance. Really, you don't understand mental illness?! Well, join the club. Neither do I (like I need to, wish to or should) but that doesn't excuse me from loving my husband with deep compassion. We don't understand cancer, do we, yet for the most part, the general public responds with kindness and deep compassion toward those who suffer with such an illness. I despise saying the same things over and over. It becomes an insult! The ignorance people speak or don't speak seems boundless. 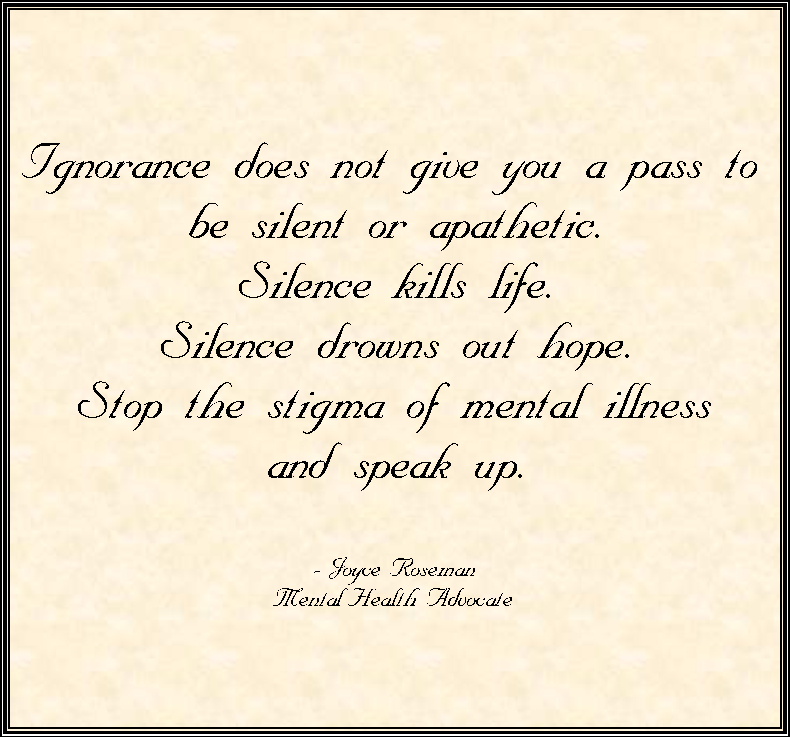 THE RESPONSE OF SILENCE OR APATHY IS GRIEVOUS TO THE PERSONS AND FAMILIES OF THOSE WITH MENTAL ILLNESS. Consider if you were silent to those suffering any other condition. People would think you rude and careless. Yet you can go about your business and speak a flippant, apathetic response, or no response at all, without a care. You turn a blind eye. You turn a deaf ear. Your heart refuses to open and engage in the conversation...because you don't understand. In a world where information is now abundant, YOU CAN CARE! You are without excuse. If you don't understand, that means you need some information and education. That isn't a pass to be silent and respond with ignorance. You don't have to completely understand a person's plight to those them love and compassion! What a flimsy excuse that is. I don't understand most diseases or difficult conditions, but I care and I say it! Sadly, though, I fine myself wanting to say, why should I care so much for your problem when you can't care about mine? People would think it rude to be careless toward the one suffering with a brain tumor, cancer or other disease. Really friends, how long are we going to have to say this? The years of silence and apathy from both Glen's family and mine has worn away at our souls. It has chipped away at hope and often it has drained us of our inner peace. I understand I can't make people respond, let alone, respond appropriately. But I will keep trying...as long as I have breath and energy. "I am sorry for the pain you are experiencing." "I don't understand your circumstances, but I am here to let you know how much I care." "What can I do right now for you?" "Even though I have not experienced similar struggles, does not mean I don't care. I do and I am committed to learning to care even more." "I love you and I support you." These are just a few easy things to say if you care for human suffering at all! 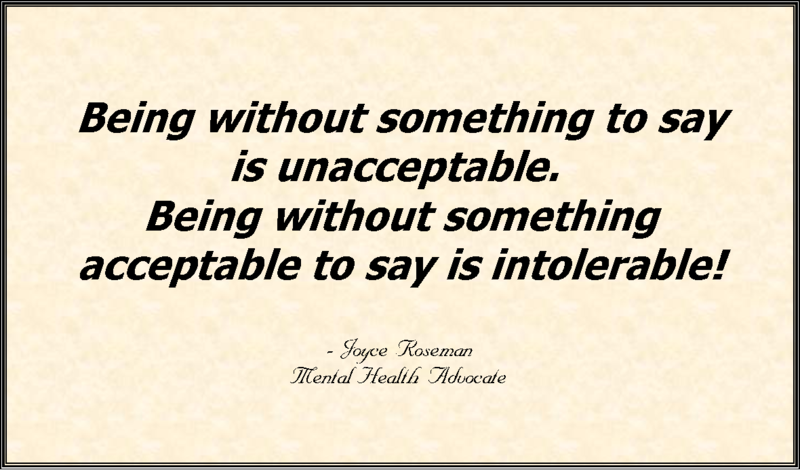 Being without something to say is unacceptable. 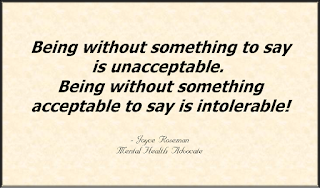 Being without something acceptable to say is intolerable!